TONIGHT (Jan. 15th): Join at the Riverside Church in Harlem (490 Riverside Drive, New York, NY 10027) at 8:00pm for a candlelight vigil honoring Martin Luther King, Jr. Other vigils are happening across the world! Members of the African-American faith community have joined forces with Occupy Wall Street to launch a new campaign for economic justice inspired by the legacy of Dr. Martin Luther King Jr. Faithful to its philosophical origin, the "Occupy the Dream" coalition has called for a National Day of Action to Occupy the Federal Reserve tomorrow to focus attention on the gross injustice visited upon the 99% by the financial elite. Clergy members and Occupiers in over 16 cities will come together in Austin, Atlanta, Boston, Chicago, Cleveland, Dallas, DC, Kansas City, Los Angeles, Miami, Minneapolis, New Orleans, Philadelphia, Richmond, San Francisco, St. Louis, Wilmington, and beyond. In Manhattan, we will gather tomorrow (Jan. 16th) from 10am to 1pm at 33 Liberty Street (NY, NY 10045). 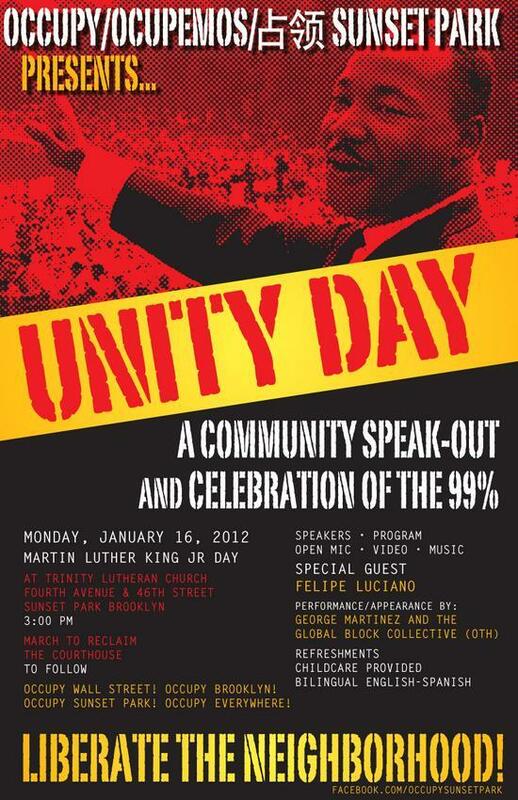 Afterward, join Occupiers in Sunset Park, Brooklyn for a 99% Unity Day celebration and community speak-out to commemorate Martin Luther King, Jr! We will be gathering at Trinity Lutheran Church (4th Ave & 46th St in Sunset Park) at 3pm. There will be refreshments, childcare, English-Spanish translation, speakers, performances, an open mic, and a march to the court house! Boston: The Occupy Boston People of Color Working Group will host OB's weekly Community Gathering encourage participants to think about what Occupy Boston and the public can learn from the ideas, campaigns, and legacy of Dr. Martin Luther King Jr. Attendees of this free event will listen to excerpts from King's speeches and hear from activists from the 1968 Tent City occupation of the National Mall. There will also be a teach-in about the failure of "3 strikes/habitual offender" legislation, open discussion about racism and the Occupy movement, slam poetry, hip-hop, and more. Philadelphia: Occupy Vacant Lots and the Housing and Economoic Empowerment Group will come together for an MLK Day of Service to help cleanup local lots for community use before marching in the Occupy the Dream March in Center City. Minneapolis: Occupy The Hood will be hosting an MLK Day March for Jobs, Housing, and Justice. From their statement: "On this King Day observation we will march in the spirit of Dr. King’s desire for justice for all. So in his honor we march to demand: jobs for all; a freeze on foreclosures; housing for all; workers rights and a livable wage; no more cuts to social programs; an end to racist mass incarceration; an end to scapegoating immigrants; an end to discrimination in all its forms." Chicago: Occupiers will kick off the Occupy the Dream Week of Action by going directly into the communities hit hardest by the foreclosure crisis and reclaiming a boarded up home to give it to a family in need. Also, after a discussion about Martin Luther King Jr.'s 1966 work and legacy in the housing struggle in Chicago (including the formation of tenant unions, rent strikes and eviction blockades that became central to the black struggle for housing justice), a coalition of Chicago community groups will begin a city-wide canvassing effort targeting homeowners facing foreclosure. Events and actions will follow all week. Baltimore: In honor of Martin Luther King and Occupy the Dream, protesters will begin a five-day occupation of the proposed site of a juvenile detention center. The youth jail will cost over $100 million, even as the city intends to close or privatize recreation centers because of "budget shortages." Schools Not Jails! seeks "to demand a change in how city and state funding is deployed; let’s confront the institutionalized social, political, and economic racism in this city head on. Let’s fight together for better jobs, better schools, a better Baltimore for everyone." Atlanta: Occupy Atlanta will continue to camp out in front of Higher Ground Empowerment Center, a beloved local church that has offered programs and resources for the area's under-resourced communities, which stands to be foreclosed on by BB&T. Occupy Wall Street demonstrators arrive at Riverside Church for a service to honor Martin Luther King, Jr. on Jan. 15. More marches were happening on Monday. About 100 Occupy Wall Street protesters marched from New York's African Burial Ground to the Federal Reserve for Martin Luther King Jr. Day on Monday, saying the civil rights leader's work echoes in their own fight for more economic opportunity. "He set the benchmark," protester Ted Actie said. "He set the blueprint as far as what Occupy Wall Street is talking about." The protesters prayed and sang "We Shall Overcome" at the burial ground, and a group of children played violins. The site is a national monument and marks the cemetery where free and enslaved Africans were buried during the 17th and 18th centuries. The protesters then marched a few blocks south to the Federal Reserve Bank of New York, where they huddled in 30-degree weather to listen to speakers who criticized corporate greed. The demonstrators carried signs reading "We oppose economic inequality" and "Democracy for sale no more." They handed out pamphlets with excerpts of King's speeches. Dozens of police accompanied marchers on foot and scooters. The demonstration was peaceful, and protesters had permits for the event. Michael Saunders, 46, of Brooklyn, said he believed King would have participated in the Occupy movement if he were alive today. "It just allows people to stand up for whatever their dream is: home ownership, a college education, a better way of life for them and their children," Saunders said. Trevor Wiessmann brought his 2 1/2-year-old son, Leo, to the march. He said he wanted to teach his son to be politically active. "I thought it was kind of important to do something civic-minded for Martin Luther King Day," he said. On Sunday, Occupy demonstrators took part in a candlelight vigil at Riverside Church in Manhattan in King's honor. Patti Smith read a poem and rapper-turned-CEO Russell Simons denounced the influence of large corporations and lobbyists. Occupy protesters also planned King Day rallies in Washington, Atlanta, Chicago and other cities. Gosh only 100? Please know that there were millions more there in spirit! Take Heart, and have a peak at - a l l - these articles coming out ..the message is reaching open ears.. Misson Accomplished! Well it seems proper since Martin Luther has been such an inspirational figure. Specially for this movement. GET LAID, BE PEACEFUL AND END HATRED. SPREAD LOVE. Remember that the "ruling class" are the real insecure and ugly people of society that need you to buy into their bullsh*t in order to "feel" anything about themselves. They have no heart, because they've been rejected by you, the "true" people of society and they create hate and fear to disillusion you from your true potential. There are no standards in a realistic world. There is only truth. There is no status, when everyone is equal. And there is no need to succeed, when your born into a truly successful society. FIGHT FOR YOUR TRUE POSITIONS IN THIS WORLD AND BE FREE NOT LIMITED TO "FREEDOM". The Dream is coming through. WTF is wrong with you? Did your mother drop you on your head? 70%+ Black illegitimacy, sweet cakes. If you're gonna live that fucked up of a lifestyle, life is going to be a problem. The biggest problem blacks have today is having no idea who their dad is. Your the one that's had a head injury for not being able to figure that out. Maybe you could organize the first "MLK Find Your Dad Day". Sorry sweetie, but it isn't racist to notice what's obvious. If you don't like "MLK Find Your Dad Day", how about "MLK Live In Denial Day"? Seems more suited to you. Over 70% of black kids don't know their dad. That's a disaster and a root cause of black dysfunction and underachievement. Show your stats. Make sure when you post that you understand the difference between unmarried and not knowing who one's father is. Oh, gee, it's all better then. LOL. Are you really this stupid? Black leadership and liberals are afraid to acknowledge any role of behavior and cultural defectiveness in black underperformance. They're afraid that doing so will undermine their ability to push white grievance and all the goodies that brings. That's why they bury people like Bill Cosby in criticism and people like you throw around racism smears so freely. But as the behavior continues to deteriorate and other minorities succeed, the denials are getting more and more ridiculous and easier and easier to mock. You are another racist puke. Sure, there's no problem with the black family. I guess I just imagined it. LOL. Statistics aren't kept on literally knowing your dad. But somehow in your fucked up life if you think that's what makes for a dad, it's no wonder you can't see the problem. Loopy leftists like you may still be willing to live in denial, but the rest of us are peeling away. The 100% white grievance explanation is breaking down as the outrageous and self-destructive behavior becomes the common black culture. We're growing immune to your cheap "racist" smear. Now, how about getting out there and buying some tennis shoes. LOL. You imagined that you had stats that said that they didn't know who their father's were? [-] 0 points by Gimmeyours (0) 43 minutes ago 70%+ Black illegitimacy, sweet cakes. If you're gonna live that fucked up of a lifestyle, life is going to be a problem. The biggest problem blacks have today is having no idea who their dad is. Your the one that's had a head injury for not being able to figure that out. Maybe you could organize the first "MLK Find Your Dad Day". So, you don't actually have stats and you utilized the stats that you do not have to justify your racism. Yes, it's all made up. The black family is thriving and what problems it does have, are the sole responsibility of white oppressors. Being able to pick your dad out of a line up is the functional equivalent of having a real father. Over 70% of blacks born illegitimately is just a statistic made up by the Man and in no way is a marker for the absent black father. Maybe you can make me an honorary liberal loon living in denial. Come on sweetie, am I in? No, you're still out. You flat out lied to justify your racism. I know the truth hurts but there it is. Sweetheart, you're not just left field, you're in the parking lot. Father's Day at your house must've been interesting. LOL. So, after having been found out to be a racist loser this is all you can come up with? Tell me, why are you here? Think about your mother having venereal disease while conceiving child with the neurosyphilis degenerative neurosensory loss. Recent clinical study ( Oxford -2011) about the Neo Nazi Conservative Racists in US revealed correlation between their psychopathic behavior and the Loco Nerve dysfunction. Fantastic way to honor King's legacy..,.,,with community and action. 50 years after Dr. Martin Luther King Jr.'s murder at the Lorraine Motel, Memphis; do we think that the King family believe that it was James Earl Ray who shot Dr. King? The opposition to MLK "was based on money and the loss of money"! of businesses, millions of homes lost because of Obama’s Top Contributors Fraud. Obama then gave the same Banks billions more to use to Refinance Home Loans, most of that money ( our money ) was never used to support working Americans with their Mortgages the Banks as listed above just kept the money. NOTE: All the numbers on this page are for the 2008 election cycle and based on Federal Election Commission data released electronically on Monday, September 26, 2011. 4 more years for Afghanistan War, Getmo is still open for business Obama like Richard Nixon kept the wars going, both were elected to end the wars…both Nixon and Obama failed the People and kept the Wars going until just before Election time. Obama = Nixon = the Same Obama = Bush = the Same Obama Kept Bush Staff OBAMA KEPT most of Bush’s Top Staff Bush’s Secretary of Defense ………. Gates JUST RECENTLY REPLACED Bush’s Military Joint Chief of Staff Mullen JUST RECENTLY REPLACED Bush’s Federal Reserve Chairman .... Bernanke STILL THERE Bush’s FBI Director………….……... Mueller STILL THERE Bush’s CIA Director ……….………. Hayden Now has Bush’s General as CIA Director Bush’s Homeland Security Secretary.. Chertoff RECENTLY REPLACED Obama, even when he controlled the Senate and the House with Reid and Pelosi failed and failed massively. We are now no further from financial Collapse then we were October 2008…………..1,000 days plus have pasted and we are in a much big mess, public corruption, debt spending, political kickbacks, financial fraud by Wall Street unpunished, failed financial system. DUMP FAILURE DUMP OBAMA AND THE REPUBLICANS VOTE INDEPENDENT Independent Voters are now the Majority 52% We will make the Change! MLK Rudin Protest YouTubes and photo links from today West Village and Union Square I am not sending to any lists or groups so if you are inspired please forward thank you. 18sec http://youtu.be/JnM2MJfUrRg man passes out on ground in front of St. Vincent's Rudin's lux condos -- not a protestor! http://suzannahbtroy.blogspot.com/2012/01/man-no-wmlk-candle-light-protest-passes.html http://www.youtube.com/watch?v=Zrr5epdPvns 45 seconds No Rudin security around -- the usual harass us and shocking and petty ways at protests but tonight when we could have used their help no where to be seen. http://suzannahbtroy.blogspot.com/ photos from tonight -- blurred but MLK Banner amazing scroll down until you see us Union Square from this afternoon! Yeah, I need medication. That's the only way I could enter the stupor necessary to ignore 70%+ illegitimacy. celebrating the man ... not his color. I cannot believe the talk below ... or believe the stupidity of some of the American public/human race! I used to live between the border of sunset park and bay ridge. I also met someone there I can't find anymore from 2004 summer camp. "until the color of a man's skin has no more significance than the color of a man's eyes the dream of peace will be but a fleeting illusion!" Ras Tafari, the True Returned Christ. in war human life is expendable; in peace no human life is expendable. so they preach religious division to make us kill each other. they call us heroes to hide our murderous crimes. they preach freedom but everywhere is slavery and unpaid work. they call us terrorists because WE ARE FREEDOM FIGHTERS! it is time to stop the BS and expose their fascist tyranny and continuing crimes. the queen is head of corporate america: the Whore of Babylon riding on the back of the great beast of stolen land property rights and royal blood and holy blood BS! she is a german fascist and head of the christian church. the pope is a german fascist and head of another christian church. KNOW YOUR ENEMY!! I would not let OWS be co-opted by the Democratic party or anyone else, and I think most OWS supporters feel the same way. There is a difference between being a former supporter and one who is now.